You are here: Home / Galaxy Note 5 How-to Guide / How to take screenshot on Galaxy Note 5 without using any apps? 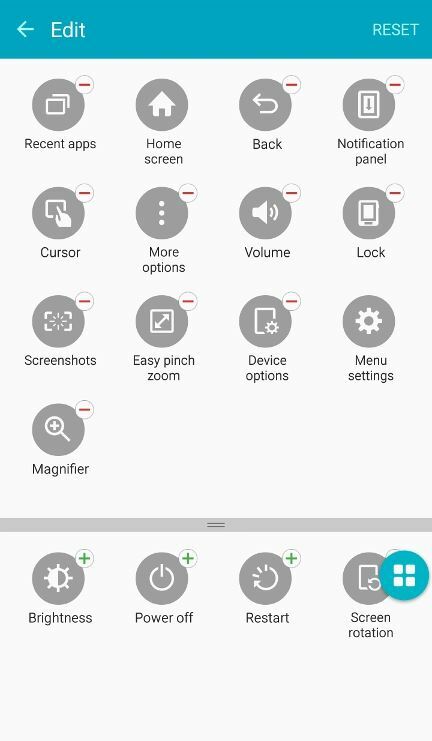 This guide shows you 4 different methods to take screenshot on Galaxy Note 5: screen write with S Pen, home button with power button, assistant menu, palm swipe. The 4 methods are also compared to show the advantages of each method. You may want to take screenshot on Galaxy Note 5 when you want to share something on your Galaxy Note 5 screen with your friends, e.g., a location on a map, or your remarkable game achievements. This guide shows you the 4 different methods to take screenshot on Galaxy Note 5 without using any apps. Update: If you want to take a screenshot for multiple screens (e.g., one screenshot for a webpage that fits several screens), you can use scroll capture feature in Galaxy Note 5, Please follow this guide if you want to use scroll capture on Galaxy Note 5. Screen write is part of air command as shown below. If the S Pen is in the S Pen slot, simply remove S Pen from the S Pen slot. By default, air command starts automatically when you are removing S Pen from the slot. Of course, you can turn off this S Pen detection feature. if the S Pen is not in S Pen slot, tap the semi-transparent dot (with an pen icon inside illustrated in the screenshot below) for air command. This is a new feature in Galaxy Note 5.
if the S pen is not in S Pen slot, hover the S Pen over the screen, then tap the S Pen button once. 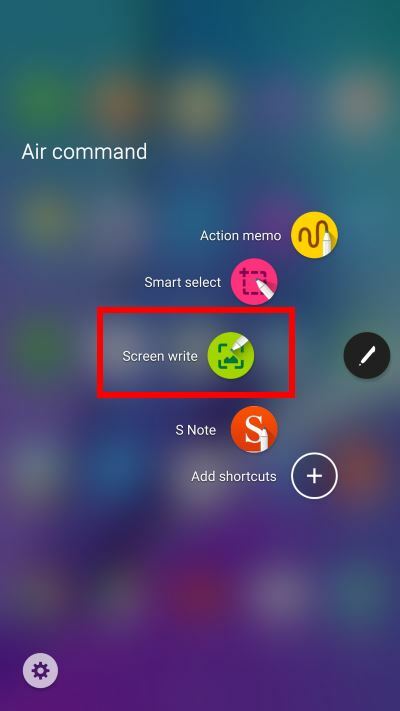 Tap Screen write as shown below with your S Pen will take screenshot on Galaxy Note 5 immediately. By default, you can only use the S Pen, not finger, to tap screen write. Once Galaxy Note 5 screenshot is taken with screen write, you will be prompted to edit and save the screenshot as shown below. You can save the screenshot to Gallery or your scratch book. Of course, you can discard the screenshot if you want by tapping the back button. 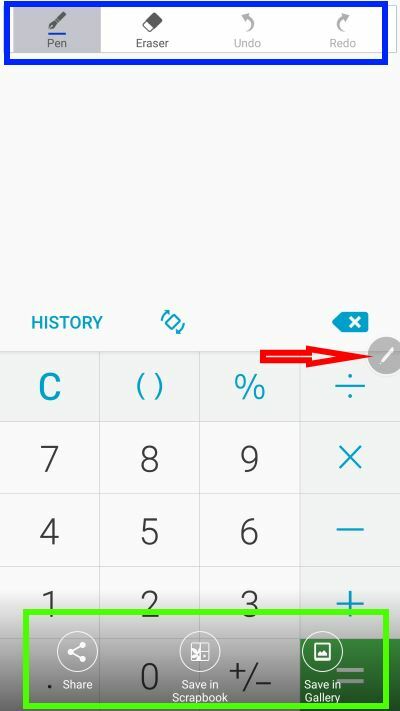 If you prefer hardware buttons for taking screenshot on Galaxy Note 5, you can use Power button + Home button. This is the traditional method of taking screenshot on all Samsung Android devices. Some vendors may implement this feature with volume button + power button if the device does not have a hardware Home button. To use this hardware button method to take screenshot on Galaxy Note 5, you need press and hold Power button and Home button simultaneously. Press and hold. You need press the 2 buttons and then hold the buttons without releasing them until the screen is captured. You will hear the shutter sound when the Galaxy Note 5 screenshot is taken if you are in sound mode. Simultaneously. You need press and hole the two buttons simultaneously. If you press Home button too early, you will get Google Now (by default). If you press power button too early, you will get the power options. So, if you fail to take screenshot on Galaxy Note 5 with this method, you may practice a bit. Once you master this method, it is quick and easy. You can also use assistant menu to take screenshot on Galaxy Note 5. This is not a well-known method to take screenshot on Galaxy Note 5 because the assistant menu is buried in the accessibility settings. 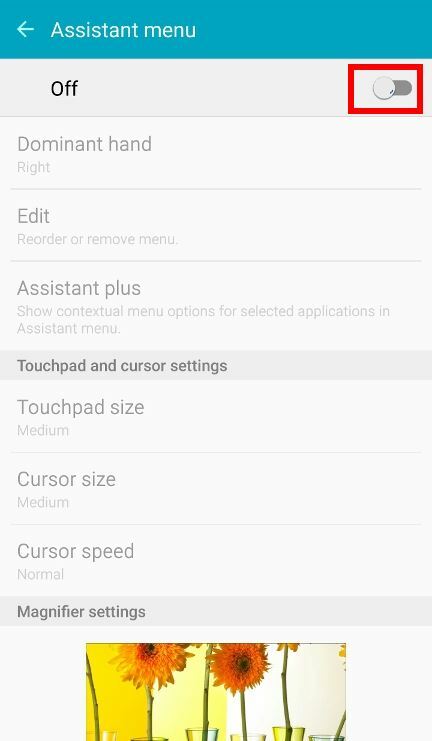 To use assistant menu to take screenshot on Galaxy Note 5, you need enable assistant menu in Settings—Accessibility —Dexterity and interaction—Assistant menu as shown below. By default assistant menu in Galaxy Note 5 is turned off. You can tap or drag the switch to turn in on as shown below. Once Galaxy Note 5 assistant menu is enabled (the switch will turn green if you use the default Galaxy Note 5 theme), you can find the assistant menu icon (4 white dots in a blue circle) as shown below. The assistant menu has some commonly used features. Tap the assistant menu icon will pop out a small window with 4 items in one page as shown below. You can scroll up and down to other pages as well. Screenshot is by default in page 3 as shown below. You can tap it to take screenshot on Galaxy Note 5 immediately. 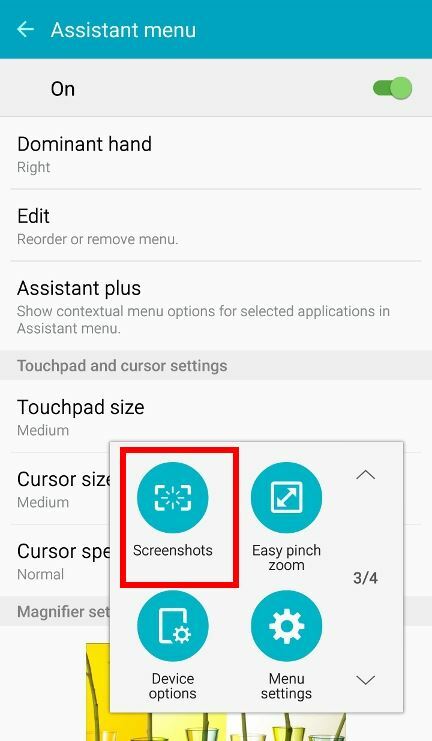 The assistant menu itself will NOT be included in the screenshot when you use screenshot button in the Galaxy Note 5 assistant menu. Only the screen under the assistant menu is captured. Of course, you can re-arrange the menu items (as shown below) in assistant menu by tapping the menu settings in the menu itself, or tapping edit in Settings—Accessibility —Dexterity and interaction—Assistant menu. 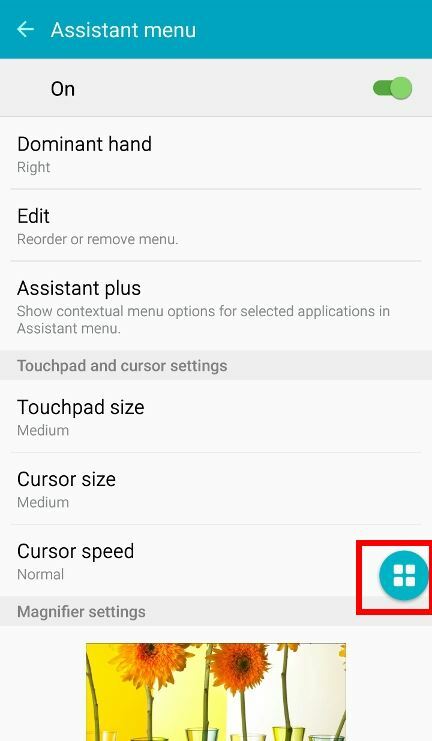 If you get used to the assistant menu in Galaxy Note 5, this can make your screen capturing on Galaxy Note 5 very easy without fiddling around the S Pen or hardware buttons. 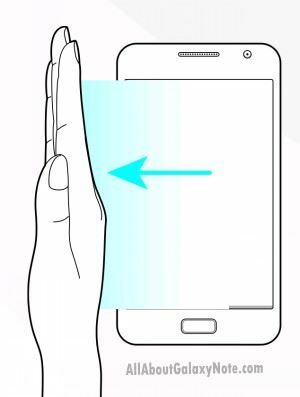 Using palm motion to take screenshot on Galaxy Note 5 is a traditional method of taking screenshot on Galaxy devices. 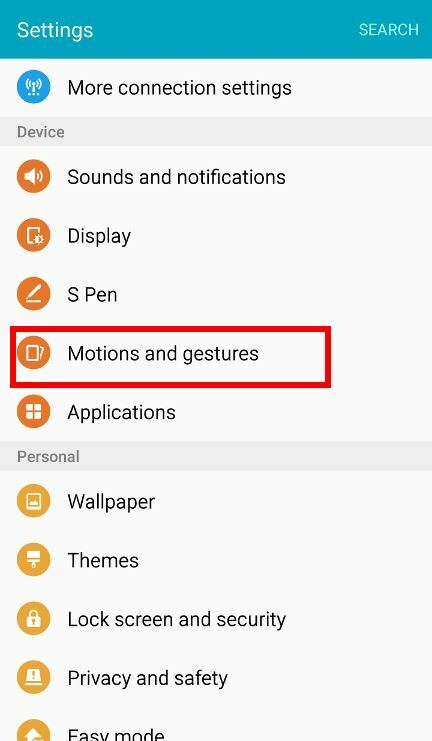 To use this method, you need enable palm motion detection in Settings—Motion and gestures—Palm swipe to capture as shown below. 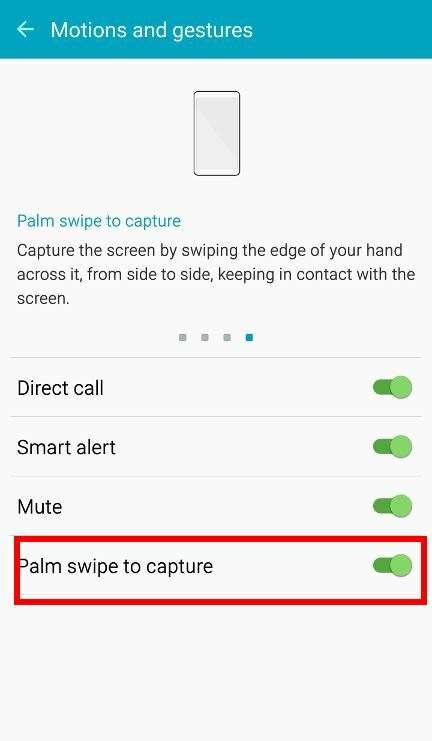 Once palm swipe to capture is enabled as shown above, you can then take screenshot for Galaxy Note 5 by swiping your palm over the screen as shown below. Please note, you can swipe from left to right or right to left. You need keep the edge of the hand touch the screen slightly. This method of taking screenshot on Galaxy Note 5 sometimes can be tricky and not efficient. But it is fun when you are not in the rush for screen captures. As discussed, you have at least 4 different methods to capture screen on Galaxy Note 5. Some owners may prefer one over the others. Now, let’s compare these 4 screen capturing methods on Galaxy Note 5. Hardware button method (method 2) probably is the fastest method among these 4 to take screenshot on Galaxy Note 5. In addition, after the screenshot is taken, Galaxy Note 5 saves the screenshot silently without asking you to edit or save. But this method requires some practice. If you do not take screenshot with this method often, you may find the successful rate is not high. Screen write (method 1) is the most reliable method to take screenshot on Galaxy Note 5. It will never fail you. Please note, Samsung does not allow you take screenshot for the video player. Assistant menu method (method 3) is probably a good option for older owners. The Galaxy Note 5 assistant menu makes it easy for old owners to use the phone, including taking screenshot. Palm swipe method (method 4) is more or less for fun, not for productivity. Can you take screenshot on Galaxy Note 5 without using any apps now? If you have any questions on how to take screenshot on Galaxy Note 5 without using any apps , or encounter any problems when capturing screen for Galaxy Note 5, please let us know in the comment box below. For other Galaxy Note 5 features and detailed Galaxy Note 5 how-to guides , please check Galaxy Note 5 how-to guides page. You may also download and read the official Samsung Galaxy Note 5 user manual here. On my Note 5 – and in Gallery, there is an album called ‘Screenshots’ but this album does not appear in Photos under either ‘Device Folders’ or ‘Choose which folders to back up’, so screenshots are uploaded with Camera whether I like it or not! I want to and do upload all my camera photos to Google Photos, but NOT my screenshots which I want to stay on the device only. Please help. Is this a software oversight in this model of phone? Google photos uploads all media files in DCIM folder. You cannot deselect the screenshots folder, which is under DCIM folder.